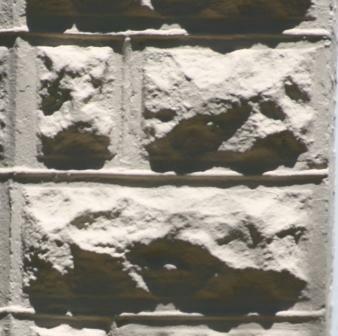 While concrete block has been around for thousands of years it did not become widely accepted as a quality building material in North America until the turn of the 20th century. This general acceptance came about as the manufacturing process became standardized throughout the industry. I would like to take a couple of posts to share the extant early 20th-century concrete block structures of Biloxi. According to the city of Biloxi plaque on the front porch this house on Benachi was built c.1905. 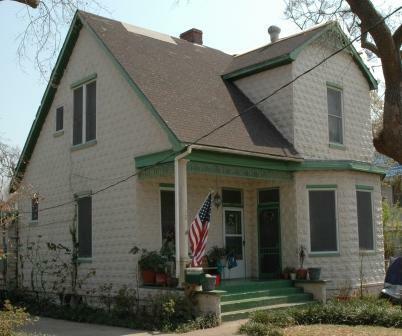 This two-story cottage has one type of block, a pinch rock face with narrow margins, but the raised-bead mortar beds add visual interest to the masonry. These rock face block are described as pinch face because the blocks come to a peak in the center, giving the face the appearance of being pinched. There are also three different lengths of block in use here: a 16-inch, a 12-inch and a 4-inch. Cast window sills, lintels and a water table cap are the other concrete features on this structure. This ad for the Baute Concrete Machinery Co. shows a machine capable of producing three different size block similar to those used in the house above. 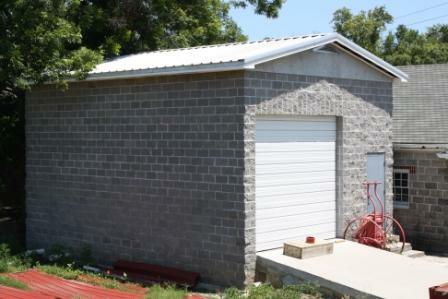 All three structures on this site utilize a faced concrete block of a different type. Two of these structures are historic. The Firehouse Museum just finished a $70,000.00 dollar restoration funded by FEMA and MEMA. 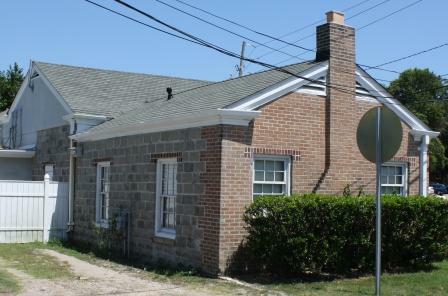 Designed by Biloxi architect John T. Collins A.I.A., the West End Fire House was built in 1937 as a WPA project. While the south and west facades of the building are faced in brick, to save cost the elevations that do not face the street were built from a 8″x16″ pinch-rock face block. The concrete used for this block contains a large aggregate. 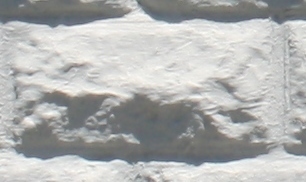 With the use of the larger aggregate, the definition of the block mold is some what lost and the lines are not as crisp. Built between 1925 and 1948 the small gas house is very utilitarian. 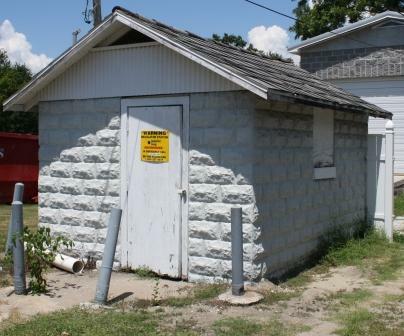 The 8″ X 16″ rock face block and cast lintels along with the asbestos roof and corrugated steel gable end are possibly all original fire resistant materials. The newer building to the rear of the property carried on the rock faced theme using an attractive modern 8″ x 16″split face block. I’ll cover other Gulf Coast examples of this versatile building material over the coming weeks. Interesting use of materials on the Benachi Cottage in a structure based off a traditional design. The roof pitch looks like the butterfly roof from traditional Creole cottages. Also, where were the blocks for these structures made? During this time period concrete manufactures were providing plan books that included traditional as well as modern designs. Blocks were made locally. Since they were so costly to ship due to there weight, the block machine was easier to transport. By 1908 a used machine could be had for $25 dollars and block making advertised as do-it-yourself projects. So it’s possible that many of these buildings were built by their owners. Owners only constructing building for personal use along with, the lack of a concrete manufacturers in Mississippi, and the low cost of lumber during this time, all speak to why this material is not more prevalant. I’ve seen several instances of black schools built with concrete block made on the site by men who were donating their labor to build their school. It was seen as a more substantial material than wood construction but at the same time, as Thomas notes, a material that could be made easily by relatively unskilled labor. Hi! I live in the cottage on Benachi. Post Katrina, the kitchen at the back of the house was damaged and had to be removed and rebuilt. In doing so, part of the unpainted exterior wall was uncovered and we decided to leave it unpainted. 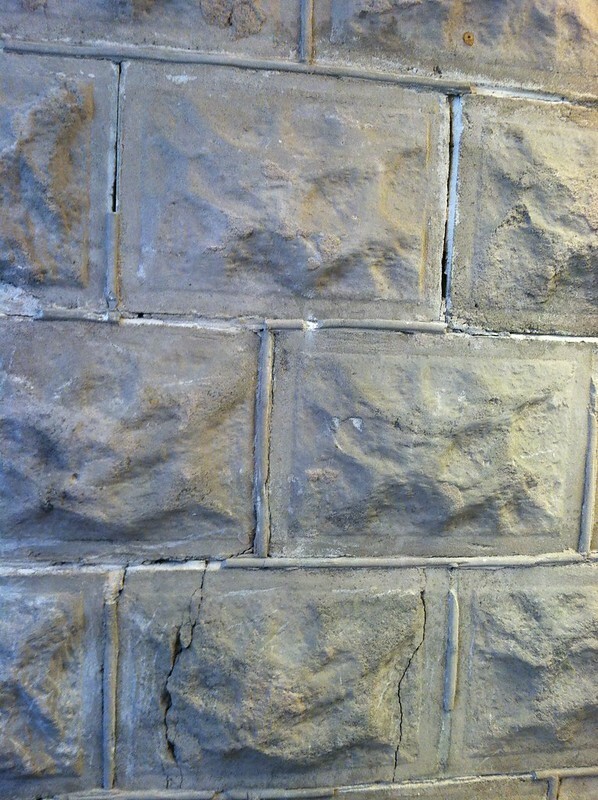 I thought you might be interested in some pictures of the unpainted bricks with the original pointing on them. There is some very dark material around the wall in the photos and that is not original, it’s a flexible material that was used to fill in some holes in the mortar. You might be interested to know that in places where the original brick has cracked or broken, there appears to have been hair added to the concrete mix. It’s not visible in any of the pictures, but there are a few broken bricks in yard where it can be seen. Wow thank you for sharing your wonderful house with us, and for sharing those photographs!!! 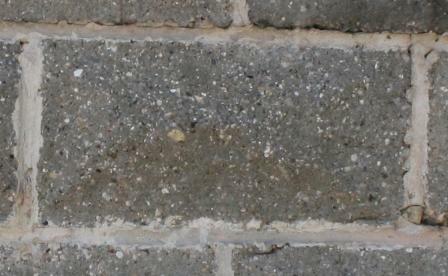 The beaded mortar joints are particularly great. It is a feature that your house shares with the Capt. Bowen house on the corner of Howard Ave. and Lee Street. I recently found a 1905 newspaper clipping that attributes the Bowen house to the Biloxi Architect and Builder W. T. Harkness, so its possible he designed your house also. But there were several other firms that were dealing exclusively in concrete block that I need to look into before I could say for sure.. I am not able to make out the dark fill in the photos, but Ill speculate that it is a backer rod type material and may or may not be original. I have some Ideas as to what the fibrous material you see in the broken blocks might be and why it was utilized, but I can probably find the specific material and purpose once Ive had a chance to research some of those concrete block exclusive firms I mentioned. I think you made the right decision in leaving the blocks unpainted. It looks so good unpainted. You mention a few broken blocks in the yard. Do you know where they came from? I ask because I wondered if they were part of another structure. Or if they were simply left over after construction. The blocks in the yard came from under the house, so they were likely leftover and stashed under there in case repairs were needed? I took a close look and the hair is in the mortar, not the bricks. It’s pretty short and fine, it could have been scraped from a cow or horse hide. We’ve looked at the Captain Bowen house, but the brick faces are a little different. According to my sister, the closest house to ours with the same pinch-face brick used to be up on Division or BayView but it was lost to Katrina. I’ll ask her where it was, maybe there are a few bricks left on the lot. Like ours, occasionally they get pulled out and used to fill in gaps where the dog dug under the fence or ‘whatever’. It was smaller than either ours or the Bowen house. That is a good idea that extra block would be produced for future repairs. The concrete machine’s face plates were easily changeable and capable of producing all kinds of appearances and shapes. I think the Bowen house is an anomaly as 8 different face plates were utilized. That house likely was a show case for the Bavatavia Canning Company(who produced the block) and the newly formed Gulf Coast Concrete Construction Company(the subsidiary of Bavatavia who built it). Adversely it could have been built by the Biloxi Concrete Construction Company a firm that was founded about a year later in 1906. Thank you for the tip about the house near back bay. I’ll have to look into in and let you know what I find!